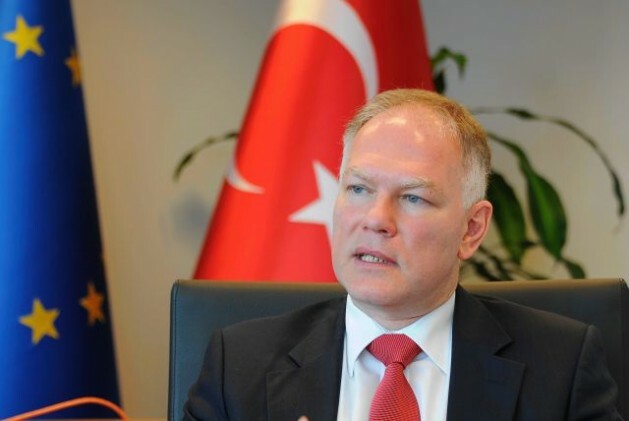 Ambassador Selim Yenel is Permanent Delegate of Turkey to the European Union. He has served in Afghanistan, at the U.N. in New York, as Ambassador to Austria, and as Turkey’s Deputy Undersecretary for European Affairs. This article is based on his presentation at a symposium of the African, Caribbean and Pacific (ACP) Group of 79 States to celebrate their 40th anniversary on Jun. 4-5 in Brussels. BRUSSELS, Jun 7 2015 (IPS) - Turkey assumed the Presidency of the Group of 20 (G20) on Dec. 1, 2014. It will culminate in the Antalya Summit on Nov. 15-16. Our priorities build upon the G20 multi-year agenda, but also reflect particular themes we see as important for 2015. We have a moral obligation to address inequality, which also hinders economic growth. We want to channel the influence of the G20 also for the benefit of the global community. Spain, Azerbaijan, Singapore and the Chairs of ASEAN (Malaysia), African Union (Zimbabwe) and NEPAD-New Partnership for Africa’s Development (Senegal) are invited to G20 meetings. We have an ambitious agenda, a clear focus and an intense work plan. We frame our priorities as ‘3 Is’. – Implementation, Inclusiveness, Investment. – Turning words into actions. Implementing our collective G-20 commitments. – The IMF and OECD calculate that implementing G20 growth strategies can generate additional two trillion dollars to the world economy, an output equivalent to the size of the Indian economy. – The first accountability report on how much progress we have collectively made towards our growth target will be presented to the G20 Summit in Antalya. – The G20’s overarching aim has been to foster strong, sustainable and balanced growth. One of our primary goals is to add “inclusive” growth to this, both at the national and international level. – Last year, the G20 made a commitment to reduce the gender gap in labour force participation by 25 percent until 2025 (our 25 by 25 target). Its implementation will bring additional 100 million women into the workforce. – We will strive to achieve a collective G20 target for youth unemployment. – SMEs (small and medium enterprises) are another important element. They are the powerhouse of employment, innovation and entrepreneurial spirit. – We launched the World SME Forum (WSF) on May 23. Turkey’s Deputy Prime Minister Ali Babacan announced the official launch of this forum, a major new initiative to drive the contributions of SMEs to global economic growth and employment. For the first time, there will now be a united and global voice of SMEs. – Low Income Developing Countries (LIDCs) are an important focal point. Our message: the G20 is not only concerned about its own interests but its policies should also benefit the entire community, resulting in a better global dialogue. – Investment is key to unlocking growth and generating new jobs. – The public sector cannot meet the global investment gap alone. Effective public and private sector partnership is a must. Nine out of 10 new jobs are created as a result of private investment. – We proposed that G20 countries prepare national investment strategies to support their national growth strategies adopted last year. We have started to work on our national investment strategies and plan to have them submitted for the approval of at the Antalya Summit. 2015 is a critical year for shaping the global sustainable development agenda for the future. We aim to support the universal nature of the post 2015-development agenda. Our work on food security and nutrition, access to affordable and reliable energy to all, efforts to reduce the gender gap in female labour force participation, skills development and infrastructure are directly relevant to many of the proposed goals and targets. The main topics of the G20 Agriculture Ministers Meeting on May 8, the second in G20 history (first was in 2011), were developing sustainable food systems and the challenges of food loss and waste. Some 1.3 billion tonnes of food is lost or wasted each year. If we can reduce food losses and waste to zero, it would give us additional food to feed two billion people. Our work on energy access in Sub Saharan Africa is another important element of our agenda. We are working in partnership with various African institutions. Almost one-fifth of the global population still does not have access to electricity. Nearly 2.6 billion people lack access to modern cooking facilities. In Sub-Saharan Africa the problem is most acute. More than 620 million people, out of the region’s total population of 915 million, have no access to electricity. A high-level conference with the participation of African leaders, investors, private sector and relevant international organisations back to back with the G20 Energy Ministers meeting is also planned. The G20 Energy Ministers Meeting on Oct. 2 will be a first in G20 history. We are also working closely with the ILO and other international organisations on a range of employment and labour market outcomes. Trade is an important part of our agenda. Representing 76 percent of world trade, G20 should lead by example in collective work to ensure an open and functioning multilateral trading system. We are also working to strengthen outreach with engagement groups and non-members. Under our Presidency, G20 countries agreed to establish a new G20 engagement group: The Womens-20, to promote gender inclusive growth and enhance the role of women in business. We also value direct outreach and dialogue with countries, regional groups and institutions. On Apr. 13, we convened in Washington the first Caribbean Region Dialogue with the G20 Development Working Group together with the Central Bank of Trinidad and Tobago. This was an opportunity to deepen the G20-Caribbean relationship. Overall, Turkey believes it has a responsibility to use its Presidency of the G20 as a positive influence regarding growth, sustainability and development in all areas. Independent of the G20, Turkey in the last decade has been more and more involved with the African, Caribbean and Pacific (ACP) Group of States. It has developed its relations in the political, economic, commercial and development fields. Turkey has opened a large number of embassies in all the ACP countries and will continue to increase its contacts in the years to come for a mutually beneficial relationship.